Z Elevators are well suited for gentle handling of a broad range of bulk products in food,agriculture, pharmaceutical, cosmetic, chemical, ceramic, glass, recycling, building and metallurgy industries etc. Materials like seed, grains, coffee, sweets, sugar, rice, beans, pet food, peanuts, flakestea and many more can be carefully conveyed from one point to another. Designed for long rugged service life and gentle handling of the material. Longer feeding length (1.5 metres) for better fitting of buckets and better stability. 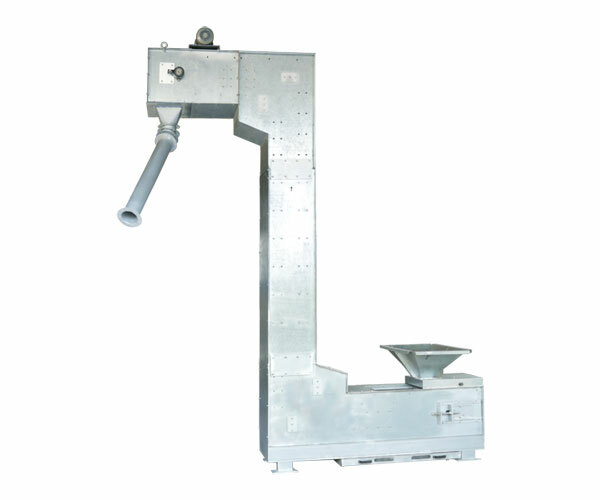 Horizontal bucket straightener provided at the feeding and discharge end to guide bucket in straight line. All components are made of Galvanized Iron (GI) on CNC machines.